However the going is not that easy. 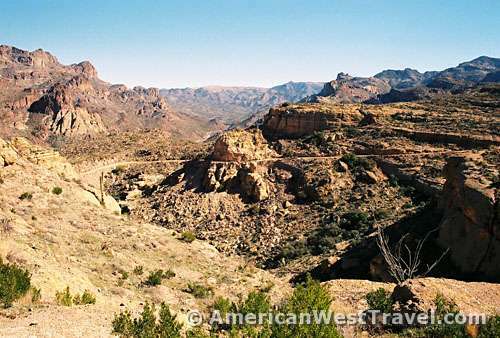 The Apache Trail twists and turns through contorted canyons and desert saguaro forests. It features twenty unpaved miles between Tortilla Flat and Roosevelt Dam, including the tortuous and thrilling drop down Fish Creek Hill. The route drops about 900 feet in a mile into Fish Creek Canyon. There are several attractions before reaching Fish Creek. 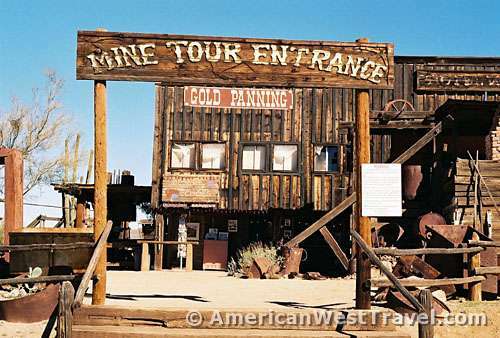 Roughly five miles north of Apache Junction, the "tourist" ghost town of Goldfield, an 1893 gold boomtown, offers mine tours, gold panning, exhibits, and specialty stores. Another half mile brings you to the entrance of Lost Dutchman State Park. 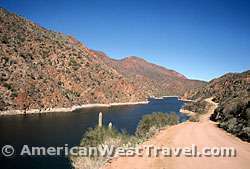 The park offers camping, picnicking, guided activities in season, and hiking trails with access to the adjacent Superstition Wilderness. 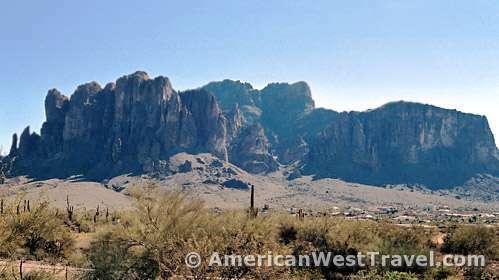 Its name, Lost Dutchman, refers to the old prospector, Jacob Waltz, who died without revealing the location of his fabled gold mine, deep in the Superstitions. Adventurers have been searching in vain for the mine ever since. 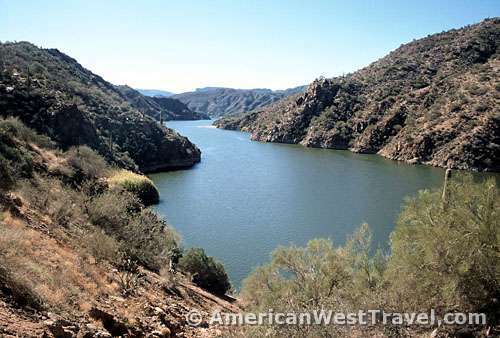 Beyond the park, Apache Trail twists and turns through scenic foothills before arriving at Canyon Lake where you will find recreation facilities and wonderful vistas. 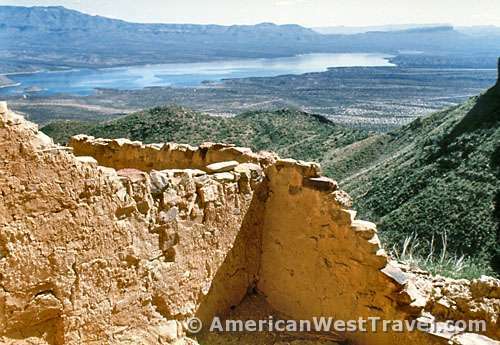 One view features the famous Four Peaks towering in the background above the lake. 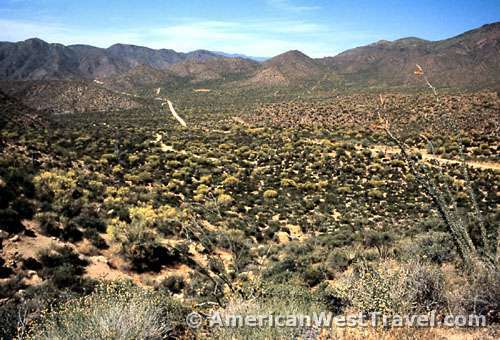 The pavement ends shortly after Tortilla Flat, and the feeling of wilderness begins to prevail. Colorful gorges below the road and distant mountain ranges provide world-class scenery. Be sure to stop at the modern rest area just before the drop into Fish Creek Canyon. There are clean bathrooms and a well-placed scenic viewpoint. Apache Trail then begins its famous drop into Fish Creek Canyon. The steep route becomes one lane with occasional pullouts for uphill traffic. Use extreme caution, and avoid ogling the beautiful scenery until you reach the bottom! 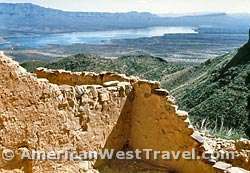 The driving is then quite easy and comfortable until reaching Apache Lake. There is a turnoff to the lakeside facilities but the main road generally stays high above the lake. From here until Roosevelt Dam the driving becomes rougher, requiring more attention. 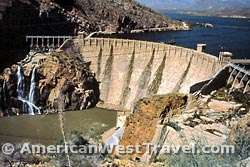 Just before Roosevelt Dam, the pavement resumes, and you arrive at a fine rest area with clean facilities, a picnic table, and an overlook with an excellent view of the dam. 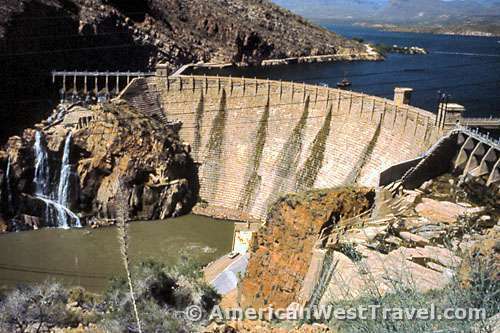 Roosevelt had originally been the world's largest masonry dam, built with stone blocks to a height of 280 feet. 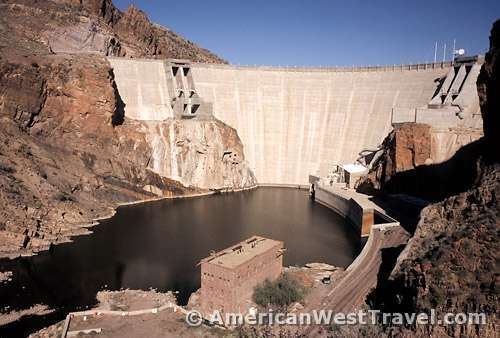 For safety reasons, the dam was rebuilt (from 1989-1996) as a concrete arch structure, and the height was raised to 357 feet, intending to increase the capacity of Roosevelt Lake. Ironically, the severe drought of recent years has instead greatly shrunk the lake. 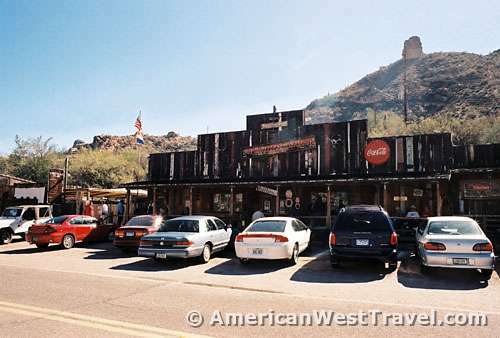 Upon reaching US-60, head west for the return to Apache Junction. Along the way are the historic mining towns of Globe, Miami, and Superior. 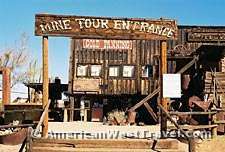 There were originally silver strikes here, but the principal ore has long been copper. The huge mountains of tailings are quite evident along the road. Stop at the Boyce Thompson Arboretum, three miles west of Superior, if you have time. One of the west's finest desert botanical gardens, Boyce Thompson offers several miles of beautiful walking trails, the best one along lush and wooded Queen Creek. Another half hour of driving brings you back to Apache Junction. 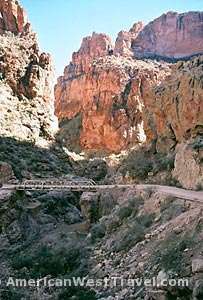 For more information, visit Tonto National Forest's Apache Trail Scenic Byway web page, or call the Tonto National Forest Service Office at 602-225-5200. To reach the Apache Trail from central Phoenix, head east on US 60 to Apache Junction, then north on Arizona 88.